With a population of over 1.5 million, the capital of Malaysia is one of the most colorful and dynamic cities of the world. KL, as it is most popularly known, is a unique mixture of old and new..where graceful Mosques, elaborately designed Chinese and Indian temples merge with modern skyscrapers and office blocks. Youll find shops selling traditional Chinese medicine, wizened fortune tellers setting up on pavements, little hole in the wall shops with signs in Arabic, Chinese and Roman..selling everything from incense sticks to deodorants...and all of this amidst supermarkets and malls stocking the latest designer luxury items. Therell be the ever popular open air stalls (or hawkers, as theyre known) serving up all kinds of local cuisine, from South Indian dosas, idlis, wadas to Malay Nonya food to Chinese dumplings and yaung tau foo. And if you fancy Western, try out the plentiful coffee shops, pizzerias and restaurants scattered all over the city. Its a dazzling blend of cultures and people...all of which contribute to form a colorful milieu..and give an introduction to the country of Malaysia. The unit of currency is the Malaysian ringgit (RM), which is divided into 100 sen. It comes in RM1, 5, 10, 20, 50 and 100 notes. There are no RM500 or RM1000 notes, both of which were withdrawn in 1998 and ceased to be legal tender in July 1999. Bank Negara reintroduced the RM1 banknote into circulation in November 2000, the sixth and last denomination to be issued in the current local currency note series. With the reissuance of the RM1 note, RM2 notes will be gradually withdrawn from circulation (although the RM1 coins will still be accepted). Click here for currency conversion. All major credit cards are accepted at upmarket hotels, restaurants. and shops. If you have a credit card with a personal identification number (PIN) attached, you can obtain cash advances from ATMs. Banks in Malaysia are linking up with international banking networks, which will allow you to withdraw money from overseas savings accounts through ATMs. 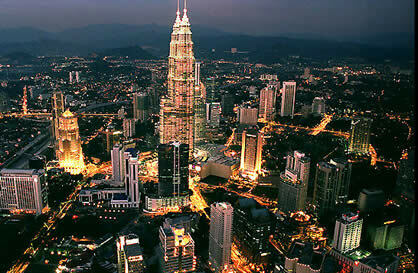 Before your trip, check with your bank to see if you can withdraw money from your home account while in Malaysia. Tipping is usually not necessary, unless service is excellent. Most hotels and large restaurants automatically add a 10% service charge in addition to the 5% government tax to the bill.